After the world tour - Morocco, Paris, Norway - we went back home to Singapore. BUT, to my surprise, there was another holiday. Who can complain, right? The Four Seasons in the Maldives. Just the sun, the sand, and the fish. It'll be a relaxing four day weekend by the pool sipping a delicious, ice cold virgin Margarita. We're actually going snorkeling later, so I'll be able to spot some sting rays, sharks, parrot fish, and other sea folk. Crossing my fingers! If there are no fish, I might just laze away my day in the private serenity pool. Boy do I love it here. Get ready for a bombardment of photos this week! I love everything about your outfit! That shirt's collar is awesome! Love this outfit! blouse+metal necklace=cool combo! love that gold disc neck piece.. JEalous!! You look great, and so does the pool! thanks for stopping by our blog! so jealous of your travels, and love your outfits! Lovely post! Your skirt and shoes are just amazing! I love this outfit, really stylish! what a pretty place! and omg i love your outfit, its so cool i have to follow you now! u look great! good blog! So amazing look! i like this blog great! your shoes and skirt, are amaxzinG!! Amazing style! Love your posts! would you like to follow each other...??? I envy the sun, warm and beautiful weather! sweet. love Bergen, used to live in Stavanger for a couple years! Your outfit, the location, the weather and you, it's all so perfect! Wish it was summer over here..
you look awesome! I love your look and your hair! you have the most beautiful hair! i love the lace detailing on the entire upper half of this blouse, rather than just a lace trim. the statement necklace gives the outfit some edge. love your style! looks just great! love the shoes! I want those pants, too :( Sooo great! Fabulous! I love your look and this place! I wish it was summer here as well! Wow you look very pretty. Thank you for your lovely comment =) I am your new follower! Such a great look!Love the necklace! Ooh, your necklace is quite a gorgeous statement piece! Your blog is lovely, your hair is soooooo nice and you have great style. You're very good for a 16 years old :O I got impressed. Following you ;) If you liked my blog too, you follow me, right? Sh#t, I'm havin great difficult to comment in your blog, don't know why. lovely skirt!!! :) fantastic pictures !!! cute skirt and i love the collar of your shirt. i'm following you now, hope you come visit my blog too! Love the creepers babe! Looks like you are in heaven! Wish I could be at that place right now, it's so pretty. Like your outfit, those shoes look so cool on you! Ohh, this looks like the most incredible getaway! <3 I love your outfit too - the necklace looks wonderful with the collar! love the look with the necklace!! super chic! You are winning in this outfit. Love that the shoes flatform ties in with the pool coloring. so in love with your blog! just fell upon it today. now following. definitely say hi back if ya fancy! happy luna new year. I wish I could be in Maldives right now. Love your necklace. You've got so beautiful hair!! great outfit!!!! i love the skirt and shoes!!!!! enjoy your holidays!!!!! nice outfit and cool photos!!! You have amazing photos :), i'm waiting for new post :D ! and the Maldives just WOW it's an incredible place. 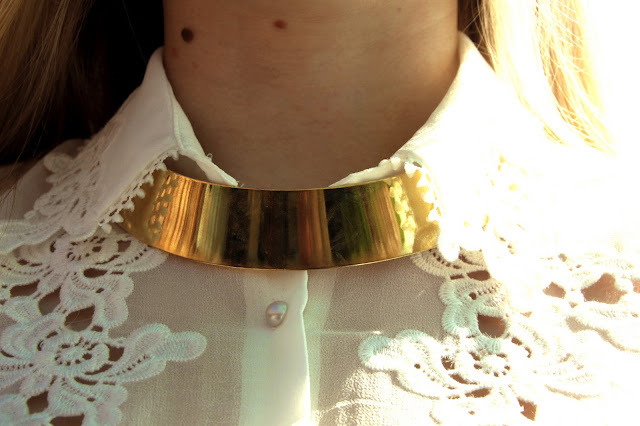 beautiful collar necklace, i love how your paired it with the austere blouse, a very peasant meets exotic look! I love your shoes! I am new you this blogger world..please follow me and comment it for my new post!! Thank you..
Poolside! Here it started snowing! I love the choker necklace!! Those Pradas are just the greatest. Magnfique look, et ca rend super bien avec les creepers ! how insanely gorgeous does it look there?! also, LOVE your Prada shoes! Love your necklace dear!!! And your blouse is so cute!!! Il est splendide ton look!!! Ooooo I really love the detailing on your blouse! So cute :) Very great look!! thank you! :) i like your necklace! 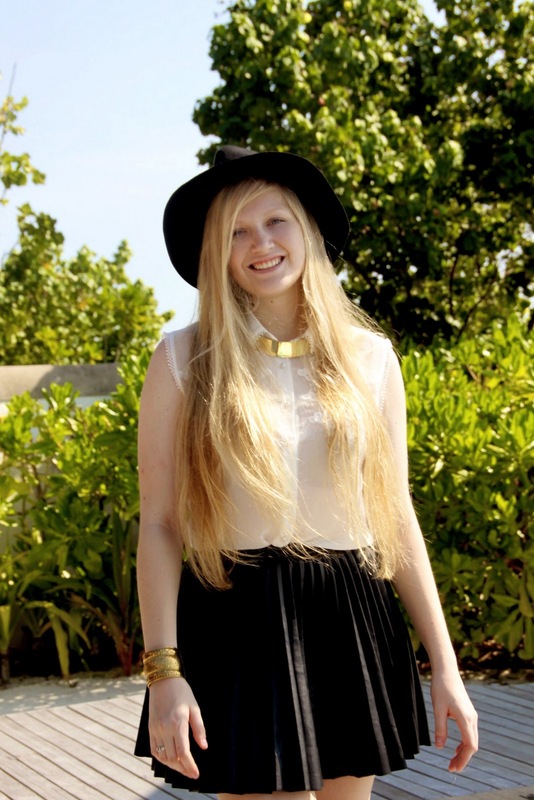 Fedora and black skirt. Your shoes are just adorable! thank you for the lovely comments, here I am following you back. wooww! what a lovely place!! And you girl look amazing! Love this necklace! Your outfit is great. Love the shoes ! You look fantastic! And let me tell you how jealous I am since I'm in rainy London at the moment! i'm so jealous of that necklace! you look beautiful! Thank you for visiting my blog and your lovely comment - much appreciated! That sounds like heaven being in the Maldives! And I love that necklace, it contrasts amazingly with the lace collar! I follow you :) Do you like to follow me back? Thanks. wonderful pictures dear! i'm so in love with your blouse! I like your long blond hair and neckless is perfect! Love the necklace and shoes! Plus, I think we're long lost hair sisters <3 Following! love the skirt :) and the necklace too! you look so pretty ;-) following now your blog hope you visit mine and follow too. I love this outfit! I'm obsessed with collar necklaces! And the hat is the perfect touch! I'm loving hats right now but always forget to wear them... your inspiring me to wear more hats hahah! Love the blog, following!